Infections of the reproductive tract, complications after childbirth, and reproductive problems continue to be a major health challenge worldwide. An impressive number of plant species is traditionally used to remedy such afflictions, and some have been investigated for their efficacy with positive results. A total of 105 plant species belonging to 91 genera and 62 families were documented and identified as herbal remedies for reproductive problems in Northern Peru. Most species used were Asteraceae (9.52%), followed by Lamiaceae and Fabaceae (8.57% and 6.67%). The most important families are clearly represented very similarly to their overall importance in the local pharmacopoeia. The majority of herbal preparations for reproductive afflictions were prepared from the leaves of plants (22.72%), the whole plant (21.97%), and stems (21.21%), while other plant parts were used less frequently. More than 60% of the cases fresh plant material was used to prepare remedies. Over 70% of the remedies were applied orally, while the remaining ones were applied topically. Many remedies were prepared as mixtures of multiple ingredients. Little scientific evidence exists to prove the efficacy of the species employed as reproductive disorder remedies in Northern Peru. Only 34% of the plants found or their congeners have been studied at all for their medicinal properties. The information gained on frequently used traditional remedies might give some leads for future targets for further analysis in order to develop new drugs. According to 1999 WHO estimates reproductive problems, including, 340 million new cases of curable Sexually Transmitted Diseases (STIs; syphilis, gonorrhoea, chlamydia and trichomoniasis) occur annually throughout the world in adults aged 15-49 years. In developing countries, STIs and their complications rank in the top five disease categories for which adults seek health care. Infection with STIs can lead to acute symptoms, chronic infection and serious delayed consequences such as infertility, ectopic pregnancy, cervical cancer and the untimely death of infants and adults . Traditional Medicine (TM) is used globally and is rapidly growing in economic importance. In developing countries, TM is often the only accessible and affordable treatment available. The WHO reports that TM is the primary health care system for 80% of the population in developing countries. In Latin America, the WHO Regional Office for the Americas (AMRO/PAHO) reports that 71% of the population in Chile and 40% of the population in Colombia have used TM. The WHO indicates that in many Asian countries TM is widely used, even though Western medicine is often readily available, and in Japan, 60-70% of allopathic doctors prescribe TMs for their patients . Complementary Alternative Medicine (CAM) is gaining popularity in many developed countries. Forty-two percent of the population in the US have used CAM at least once , and the use of at least one of 16 alternative therapies increased from 34% in 1990 to 42% in 1997 . The number of visits to providers of CAM now exceeds by far the number of visits to all primary care physicians in the US [5, 6]. The expenses for the use of TM and CAM are exponentially growing in many parts of the world. The 1997 out-of-pocket CAM expenditure was estimated at US$ 2,7 billion in the USA, and the world market for herbal medicines based on traditional knowledge is now estimated at US$ 60 billion . Northern Peru is believed to be the center of the Central Andean Health Axis , and traditional medicinal practices in this region remain an important component of everyday life [9–13]. TM is also gaining acceptance by national governments and health providers. Peru's National Program in Complementary Medicine and the Pan American Health Organization recently compared Complementary Medicine to allopathic medicine in clinics and hospitals operating within the Peruvian Social Security System. The results showed that the cost of using Traditional Medicine was less than the cost of Western therapy. In addition, for each of the criteria evaluated -- clinical efficacy, user satisfaction, and future risk reduction -- Traditional Medicine 's efficacy was higher than that of conventional treatments, including fewer side effects, higher perception of efficacy by both the patients and the clinics, and a 53-63% higher cost efficiency of Traditional Medicine over that of conventional treatments for the selected conditions . According to , the sustainable cultivation and harvesting of medicinal species is one of the most important challenges for the next few years. The present study attempts to give an overview on medicinal plant species employed in Northern Peru in traditional remedies for reproductive problems and female health, and compare this use to the western scientific evidence regarding their efficacy. Plants for the present study were collected in the field, in markets, and at the homes of traditional healers (curanderos) in Northern Peru in 10 2-3 months long field visits between 2001 and 2009, as a larger scale project following initial collections in southern Ecuador (Figure 1). The same 116 informants (healers and market vendors) in the Trujillo and Chiclayo area were repeatedly interviewed during this time, using structured questionnaires. The informants were always provided with fresh (non-dried) plant material, either collected with them, by them, or available at their market stands. The questionnaires did not include any reference as to disease concepts, plant parts or preparations. In contrast, the participants were asked simple questions along the lines "What is this plant used for, which part, which quantity, how is it prepared, are any other plants added to the mixture." All questions were asked in the same order. All informants were of Mestizo origin, and spoke only Spanish as their native language, and all interviews were conducted in Spanish. The study covered the four existing medicinal plant markets of the region, and included all vendors present. All interviews were conducted with the same set of participants. The specimens are registered under the collection series "RBU/PL," "ISA," "GER," "JULS," "EHCHL," "VFCHL," "TRUBH," and "TRUVANERICA," depending on the year of fieldwork and collection location. Surveys were conducted in Spanish by fluent speakers. Surveyors would approach healers, collectors and market vendors and explain the premise for the study, including the goal of conservation of medicinal plants in the area. 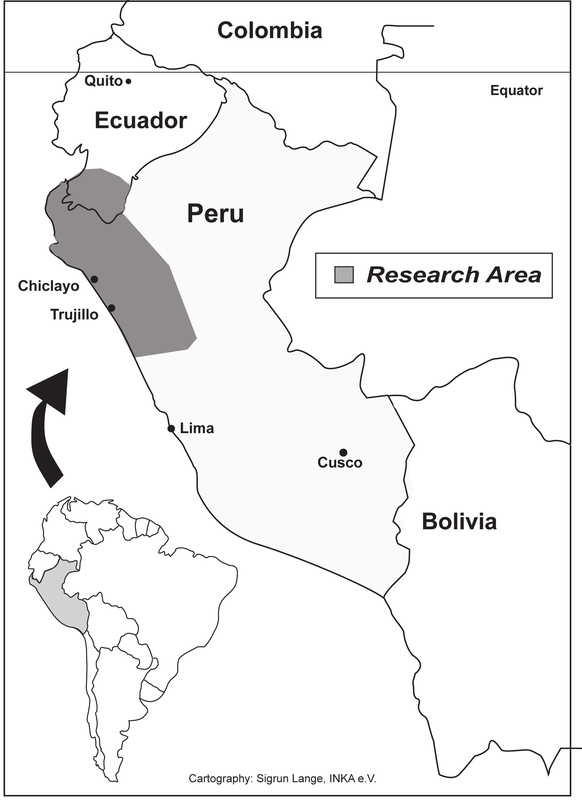 Location of the study area in Northern Peru. Vouchers of all specimens were deposited at the Herbario Truxillensis (HUT, Universidad Nacional de Trujillo), and Herbario Antenor Orrego (HAO, Universidad Privada Antenor Orrego Trujillo). In order to recognize Peru's rights under the Convention on Biological Diversity, most notably with regard to the conservation of genetic resources in the framework of a study treating medicinal plants, the identification of the plant material was conducted entirely in Peru. No plant material collected either in this study in Northern Peru, or the previous study in Southern Ecuador was exported in any form whatsoever. The nomenclature of plant families, genera, and species follows the Catalogue of the Flowering Plants and Gymnosperms of Peru  and the Catalogue of Vascular Plants of Ecuador . The nomenclature was compared to the TROPICOS database. Species were identified using the available volumes of the Flora of Peru , as well as [18–20], and the available volumes of the Flora of Ecuador . A total of 105 plant species belonging to 91 genera and 62 families were documented and identified as herbal remedies for reproductive problems in Northern Peru. Most species used were Asteraceae (9.52%), followed by Lamiaceae and Fabaceae (8.57% and 6.67%). Other families were less important, and 44 contributed only one species each to the pharmacopoeia (Table 1). The most important families are clearly represented very similarly to their overall importance in the local pharmacopoeia (Table 1) . The majority of herbal preparations for reproductive issues were prepared from the leaves of plants (22.72%), the whole plant (21.97%), and stems (21.21%), while other plant parts were used much less frequently (Table 2). This indicates that the local healers count on a very well developed knowledge about the properties of different plant parts. In almost 62% of the cases fresh plant material was used to prepare remedies, which differs little from the average herbal preparation mode in Northern Peru. Over 70% of the remedies were applied orally, while the remaining ones were applied topically. Many remedies were prepared as mixtures of multiple ingredients by boiling plant material either in water or in sugarcane spirit. A complete overview of all plants encountered is given in Table 3. Adiantum concinnum Wild. ex H.B.K. Iresine diffusa H.B.K. ex Willd. Aloe vera (L.) Burm f.
Clibadium cf. sylvestre (Aubl.) Baill. Paranephelius uniflorus Poepp. & Endl. Prosopis pallida (H. & B. ex Willd.) H.B.K. Gentianella bruneotricha (Gilg.) J.S. Pringle. Isoetes andina R. & P.
Aa paleacea (H.B.K.) Rchb. f.
Promoting vaginal dilation during childbirth. Plantago sericea R. & P. var. lanuginosa Grieseb. Pouteria lucuma (R. & P.) Kuntze. Cestrum strigilatum R. & P.
Cestrum undulatum R. & P.
Little scientific evidence exists to prove the efficacy of the species employed as reproductive disorder remedies in Northern Peru. Only 34% of the plants found or their congeners have been studied at all for their medicinal properties. Aloe spp. are known to have oestrogenic activity [22, 23]. reported that Artemisia spp. had effects on female health amongst the Cumash. A variety of other Asteraceae has been shown to be used against menopausal symptoms (Clibadium: ; Matricaria: [26–28]; Taraxacum: [29, 30]. found hormonal effects in Cordia sp., while [31–35] reported on anti-fertility effects of Dioscorea sp. Cupressus sp. are well known abortifacients (e.g. ), while pumpkin seed oil showed testosterone-inhibitory effects (e.g. [23, 37–39]). Chamaesyce sp. showed promise in the treatment of male infertility, while Mimosa sp. on the contrary are used to reduce spermal fertility [23, 40]. A wide range of Lamiaceae have been shown to exhibit contraceptive efficacy, and the same species are used in Peru for similar purposes (Mentha spp. : [41–44]; Ocimum spp. : [45–48]; Origanum majorana: [44, 49, 50]; Rosmarinus officinalis: ). Similar efficacy has been shown for Sanguisorba officinalis , and Ruta graveolens [23, 52–55]. Various species of Passiflora have aphrodisiac activity [56–60], and Myristica fragrans as well as Syzygium aromaticum [61, 62], and extracts of Lantana camara [63, 64] and Pilea spp. fulfil the same purpose, while Portulaca oleracea showed efficacy in relieving uterine bleeding [65, 66]. Infections of the reproductive tract, complications after childbirth, and reproductive problems continue to be a major health challenge worldwide. An impressive number of plant species is traditionally used to remedy such afflictions, and some have been investigated for their efficacy with positive results. An often-limiting factor to these investigations is lack of comprehensive ethnobotanical data to help choose plant candidates for potency/efficacy tests. Since the plant parts utilized in preparation of the remedies are reported in this survey, it serves as an indication of species that may need further ecological assessment on their regeneration status. The results of this study show that both indigenous and introduced species are used for the treatment of reproductive system problems. The information gained on frequently used traditional remedies might give some leads for future targets for further analysis in order to develop new drugs. However, more detailed scientific studies are desperately needed to evaluate the efficacy and safety of the remedies employed traditionally. The presented study was financed through MIRT/MHIRT (Minority Health Disparity International Research and Training) a grant from the National Institutes of Health (Fund: 54112B MHIRT Program, Grant: G0000613). Fieldwork for this project was supported through the assistance of a large number of MIRT/MHIRT students and volunteers. Thanks to all of them. None of the work would have been possible without the invaluable collaboration of Douglas Sharon and our Peruvian colleagues, especially curanderas Julia Calderón, Isabel Chinguel, and Olinda Pintado, curanderos Germán Santisteban and Leoncio Carrión, and herbalists Manuel Bejarano, Elmer Cruz, and Iván Cruz. Thanks also go to Eric Rodriguez (Herbarium Truxillense, HUT) and Abundio Sagastegui, Segundo Leiva, and Mario Zapata (Herbario Antenor Orrego, HAO) for the use of their facilities and their assistance in plant identification.